Dunham Massey, near Altrincham, is just a five minute walk from the Bridgewater Canal. A hundred years later another lady achieved notoriety rather than praise. The 7th Earl’s second wife (a circus performer) was snubbed by Queen Victoria and scorned by Cheshire society. It’s midsummer, more or less, and there’s an increase in traffic on the waterways. For those who follow other boaters’ blogs to come across boats and their crews known via the digital world is a strange sensation: there was Barry on Friday on AreandAre at Wigan, heading for Liverpool to trade at the Eldonian Village IWA Festival. At a delightful mooring at the site of the 2012 Dutton Breach (on Tuesday) there was nb Gabriel . The following day, not far from Saltersford Tunnel, the stern of a well known boat and a familiar figure flashed past: James on nb Chance, he no doubt, calculating tunnel passage times as Cleddau’s Captain had been doing, from the opposite direction. The Bridgewater Canal has unusual administration: it’s run by Peel Holdings, has a different licensing structure for boaters and currently aims to restrict C&RT licensed boats to seven days only on its waters, with no return for four weeks. Gossip and opinion is fairly common about this strategy; then, on Tuesday afternoon, near Walton Bridge, it happened. But for Cleddau it was onward: “Don’t worry about it,” the Captain replied. “We’ll be off your waters by the end of the afternoon.” Somehow time spent and time still to use become a necessary calculation of Bridgewater cruising for those boats with (conventional?) C&RT licences. the Captain began clock-watching and muttering about piloting and plotting navigation points. Ahead lay the Preston Brook Tunnel (the first of three on the northern end of the Trent and Mersey Canal). Access for this tunnel from the north can only be between 30 and 40 minutes after the hour. Calculations… calculations… Use the Sat Nav as a speedometer. At ½ of a mile in 10 minutes = 3 miles per hour, 1 mile in 15 minutes = 4 miles per hour… slower at Preston Brook past the marina and the Claymoore Canal Holiday base. There’s a cutting just before the tunnel… Time check: 1529 … 1530 … 1531 … with the tunnel now in sight there was a great roar overhead, and as if to mark the precise timing, yes, a Red Arrows salute! 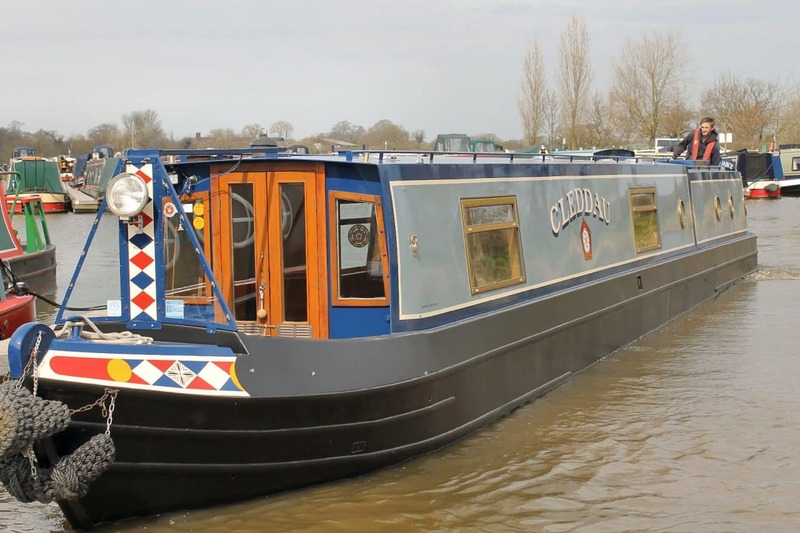 And so on Tuesday evening Cleddau was off the Bridgewater Canal and back on the Trent and Mersey, at a superb location overlooking the Weaver Valley. Worry not that this was the site of the devastating Dutton breach in September 2012.
and peacocks screeched from the opposite bank. (no time restriction at this one, just clear visibility through its 572 yards) before arriving, breathless it would seem, at Anderton – and at the Boat Lift. It was here that timing assumed a different quality. You can turn up at the Anderton Boat Lift, and wait for the next available slot on the lift. Or you can phone ahead to book one. With no answer to calls made en route, at 11am a request was made at the Booking Office window and a slot secured for 1340.
side by side with nb Arcturus, a Braidbar boat, built right opposite Victoria Pit Moorings. “We know your boat, we’ve seen it on the Macc,” the helmsman remarked.